I've been going through my chicken jars from last season, and they're very good. A thing about this summer, though, is that I don't sit at the front desk anymore; I have my own cube in the back office, and dang it's cold back there. So like, sometimes I'm dreading eating a crisp raw salad. And actually another thing about this summer is that it hasn't been consistently hot, so it's not so awful to turn on the oven. SO my real idea for this salad, say if I were to make it for company, say for a nice luncheon—because that always happens—would be to make a bunch of bacon in the oven, then roast the veggies in the bacon fat, and pile the bacon-roasted vegetables and warm bacon vinaigrette over avocado halves or maybe thinly sliced avocadoes, and top it all with bacon bits. But, no, I need something that works in jars for work. Tell me though that that doesn't sound good. It does sound good, doesn't it. Avocado napped with sizzling vinaigrette is also darn good. Heat oven to 500 degrees. 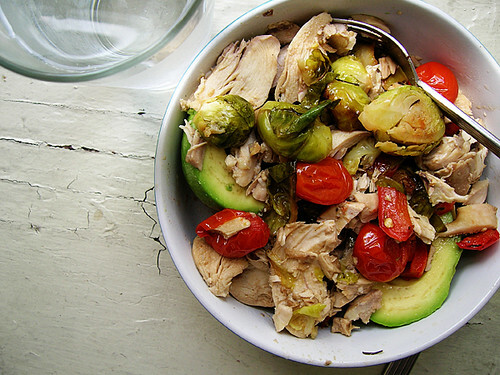 Trim and halve the brussels sprouts, dice the pepper, and leave the cherry tomatoes whole. Toss lightly with olive oil and salt in a baking pan. Roast until vegetables are softened and a little bit charred, stirring occasionally, about twenty to thirty minutes. Eyeball three-quarters of a third cup vinegar and then measure a third cup olive oil into the cup of a rocket blender, add a pinch of salt and some grinds of black pepper, and whirr it all together. Take the breast and thigh meat off the chicken, saving the rest for snacks and soup, and cut it up into bite-size pieces. Add the chicken to the vegetables when they are done, pour over the vinaigrette and toss thoroughly. At this point, I halve an avocado and spoon over a quarter of the warm chicken salad and vinaigrette. The rest of the salad gets divided between three jars, to be sent to work with three avocados. To serve from the jar, heat the jar in the microwave for three minutes—be careful, the jar will be hot—and empty it over a peeled, halved avocado.